Don't be fooled by the name. 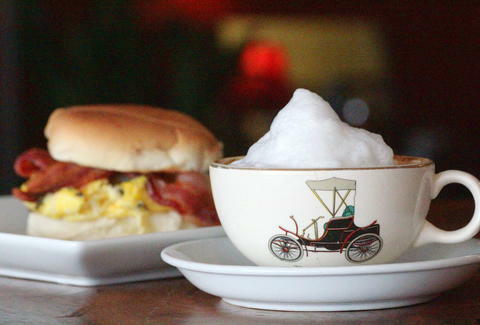 Subterranean Coffee Boutique's totally aboveboard when it comes to slinging quality java and casual eats. And they keep that casual vibe thanks to the eclectic furnishings (old mismatched furniture, stained glass chandeliers, and even the trunk-lid from an old Chevy Caprice) picked out by the owners, a couple of newlyweds for whom the honeymoon's definitely over, but mostly because they couldn't physically open the shop from Hawaii. Sourcing all of their staples from local producers (take that, actual Staples! ), the beans are from Barrio Logan roasters Cafe Moto, and the display cases are stocked with all sorts of vegan/gluten-free/real baked goods from Sweet Cheeks Bakery. For more substantial fillage, they've got bagels (try the 4-layer w/ cream cheese, pesto, tomato & red onion), a scrambled egg/ basil/ bacon sandwich on a sweet Filipino roll, and more savory noontime fare like the pepperoni and salami “Italian Stallion” with a secret sauce you can only get if you pinky swear you won't tell anyone about it (NOTE: you can also just order it). Not satisfied to just ease your jitters, they're also blending smoothies and a baker's dozen milkshakes to enjoy while jamming to their vinyl collection, though, again, don't be fooled by the name -- that's a reference to music records.